See the club’s group project here. 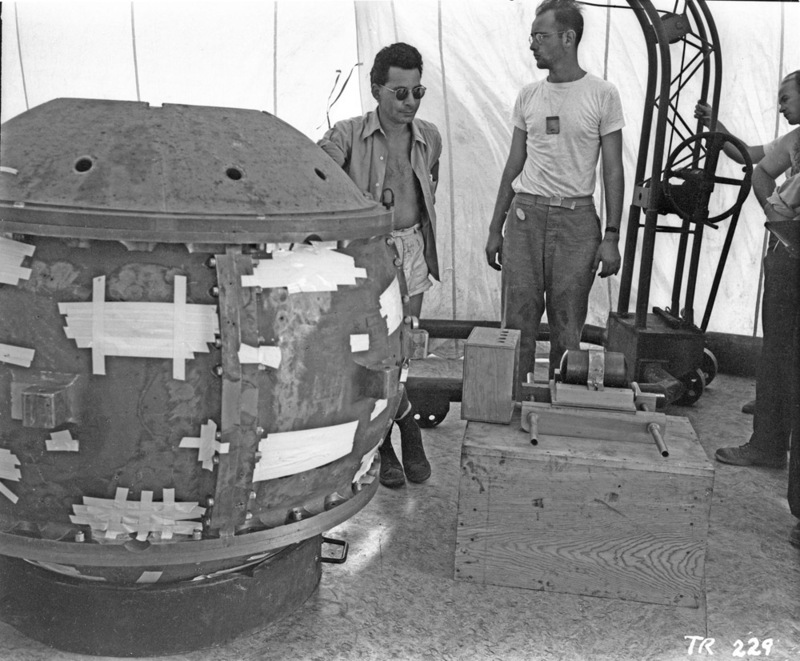 Manhattan Project scientists Louis Slotin and Herb Lehr help assemble the Trinity “Gadget”—the world’s first atomic bomb—in 1945. Once you know what you’re looking at, the big round bomb on the left is less evocative than the small, cylindrical “slug” sitting on the wooden crate on the right. That slug is made of uranium-238, and it’s heavy—hence the two-handled carrying mechanism. The uranium slug carried the plutonium sphere that ultimately reached “critical mass” and caused Trinity’s chain reaction—a nuclear explosion. The short essay never explains how the exclusive UPPU club got its name. What do you think? Pu is the chemical symbol of the element plutonium. Sound it out. The Manhattan Project was a research project that developed the world’s first nuclear weapons. Plutonium is a silvery metal that reacts with many other elements. Its atomic number 94 and its atomic weight is 244. It’s expensive, rare, and powerful stuff. “Reactor-grade plutonium” (18%) and “fuel-grade plutonium” (7%-18%) are a key fuels for nuclear power plants. “Weapons-grade plutonium” (less than 7%) was the agent used in the world’s first nuclear weapon, nicknamed the Gadget and detonated as part of the Trinity test in New Mexico in 1945. A near-twin to the Gadget, nicknamed Fat Man, was detonated at Nagasaki, Japan, just weeks later. “Supergrade plutonium” (2%-3%) is used by the U.S. Navy in its nuclear weapons. Another isotope of plutonium, Pu-238, has other uses. Pu-238 powers some pacemakers, although most pacemakers now use lithium. Pu-238 is the generating mechanism (radioisotope thermoelectric generator, ahem) for NASA missions such as Voyager, New Horizons, Apollo, and the Curiosity Mars rover. OK, so plutonium is awesome. Why is there plutonium in the urine of some scientists who worked on the Manhattan Project? In other words, in high enough doses, plutonium will settle in your body and be excreted as urine, along with water, salts, and waste products. Uh, isn’t plutonium poisoning deadly? Yes, radiation poisoning can be deadly. In particular, plutonium accumulates in bone marrow, which makes it incredibly dangerous. Plutonium is also a heavy metal, and all heavy metals (even ones that aren’t radioactive) carry significant health risks. If radiation poisoning is lethal, why are these scientists still alive? Members of the UPPU club had low-level exposure to plutonium and “the mortality rate for the group is about 50% lower than the national average.” (Note: This does not mean plutonium is good for you!) High-level exposure will likely result in an increased risk for lung cancer, and possibly bone and liver cancer. Should I be worried about exposure to plutonium? Minute amounts of plutonium settled in topsoil, although its chemical properties largely prevent it from being absorbed by plants. There are two major—and very rare—ways to join the UPPU club. In a shameful incident in U.S. history, the government conducted secret radiation (including plutonium) experiments on uninformed patients—children, soldiers, prisoners. In a shameful incident in corporate history, hundreds of young factory workers—the so-called Radium Girls—were exposed to radioactive (radium) paint making profitable glow-in-the-dark watches. In a shameful incident in Cold War history, former Soviet spy Alexander Litvinenko claimed to have been intentionally poisoned (by polonium) by his former colleagues. Nuclear weapon deployment and testing exposed thousands of people to radiation. Manhattan Project scientists Harry K. Daghlian and Louis Slotin (the shirtless scientist in the photo above) both died after criticality accidents at the Los Alamos facility. Some nuclear accidents, such as those at Chernobyl and Fukushima, can release plutonium into the atmosphere. But plutonium is not very volatile, and radioactive cesium, cobalt, uranium, and iodine are usually of much greater concern. Are any other substances radioactive? Trick question! All elements have radioactive isotopes. Radioactive isotopes (also called radionuclides) have an imbalance of nuclear energy. This imbalance makes them unstable, emitting energy (radiation) as they undergo consistent, predictable radioactive decay. The 38 so-called “radioactive” elements are those that lack any stable isotopes. Los Alamos Science: Plutonium and Health: How Great is the Risk? Previous Previous post: Weekly Warm-Up: What is World Heritage?